Nearly 20 years before Richard Sapper created the simple black box that would become ThinkPad, he had already made design magic with a very similar idea. It too was a simple black box, but for a totally different company and product category. The design was created for Jack Heuer back in 1974 for their classic Microsplit digital stopwatch. The Heuer company felt that the time had come for them to enter the digital age. Digital clocks and watches were just starting to emerge, but nobody thought to produce a digital stopwatch. 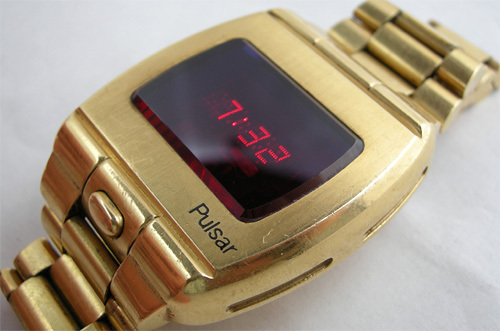 Most early digital wrist watches were more of a technology novelty than a stunning revolution in design. Heuer wisely avoided sticking a glowing red digital display in the center of a traditional round watch case and calling it a day. Instead he selected Sapper to create a design concept because he wanted something special. It was an amazing corporate decision, design and market success. No longer in production, the best place to see one today is at the MoMA. What does the stop button remind you of? For well over a decade, I personally have been on the hunt to purchase one of these wonderful stopwatches. Of course I wanted one because of the striking design, but I also wanted one because of the aesthetic connection to ThinkPad. I love the simplicity of form that reveals a more richly detailed and lively interior when you choose to open and use it. This is a hallmark of much of the work Sapper creates. I've scoured junk shops in the US and Europe, flea markets, the Internet, and of course eBay looking for the elusive prize. The hunt has finally ended. I located one on eBay a few weeks ago and was determined to buy it no matter what. I found myself in a bidding war just minutes before the auction ended, but when the smoke cleared, it was mine. It would be interesting to know who I was bidding against? Another ThinkPad fan perhaps? It arrived last night in a rather anonymous cardboard box neatly wrapped in pink bubble wrap. Certainly not the trappings worthy of such a design classic. I was thrilled to find the Microsplit to be in perfect condition. There was not even the slightest scratch in the beautifully finished matte black case. The Swiss craftsmanship was so evident. I gently slid the power switch to the on position and immediately discovered it was fully functional. I hadn't even bothered to ask the seller if it worked. Honestly, it would not have mattered to me, working was just a bonus. The only thing amiss on my newly acquired design treasure was the the lack of the original neck lanyard. I'm not too worried, however, I can easily fashion one myself. I excitedly called Richard on his cell this morning to inform him of my find. He was more than delighted to learn that I had rescued it from an uncertain home. He also generously volunteered to send me a photo of the lanyard from one in his personal archive to ensure I got it right. He's a great friend, as well as designer. I hope you enjoyed the comparison of this Heuer design classic to our own iconic ThinkPad. I just can't seem to stop looking at mine. If you admire design like I do, it's possible that you now have a new quest. In case you're curious, mine is not for sale.